The Mt. Food Bank announced on Facebook today, January 23, 2014, that it has been asked to leave its 122 E. 3rd Street location in North Bend, where it operates out of a modified garage and storage area formerly belonging to the North Bend Community Church. Longtime North Bend resident Liz Schomber said the food bank has been operating out of the location for nearly 40 years. In 2008 it expanded from 950 feet to 1,400 feet to meet local demand. The Mt. Si Food Bank will be moving out of its current spot on Wednesday, January 29, 2014. All volunteer participation at the East 3rd Street location has been canceled. New Food Bank Taking Over Spot? But it sounds like the Snoqualmie Valley won’t be without a food bank for long. According to an email from founders of the newly formed Snoqualmie Valley Food Bank, they will open in Mt Si Food Bank’s location in February. In November, when it became known that the Mt. Si Food Bank lost its tax exempt 501(3)(c) status, Board Members, the Executive Director and the Operations Manager all resigned. According to the email, the resignations were due to concern that the current management of the Mt Si Food Bank “would not be able to secure and sustain the ability to feed those in need.” The IRS website does not have the Mt. Si Food Bank listed as a local organization eligible to receive tax-deductible contributions. That team of former directors and volunteers came together and formed the Snoqualmie Valley Food Bank. They will continue helping those in need at the North Bend Community Church location, and hope to perform their first food distribution on February 5th. The Mt. Si Food Bank began in 1975 and it’s estimated currently serves about 1,200 people and families in need in the Valley. Each Wednesday, the Mt Si Food Bank opened its doors, serving a hot meal and providing groceries to those in need. This story will be updated as more information becomes available. 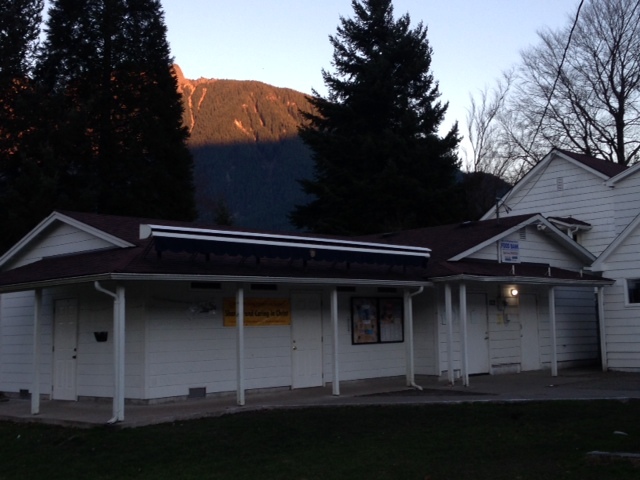 The Mt Si Food Bank has been contacted regarding a possible new location and timeframe for re-opening its doors. Thanks for this post. You have more info than either the SnoValleyStar or Valley Record newspaper sites do. As a donor to Mt. Si, I’m troubled to hear that there were management and board resignations recently and no apparent explanation of that covered in the media or announced by Mt. Si itself. I find myself wondering about whether I should continue supporting Mt. Si or the new group given this intrigue (and do we need two competing groups?). I’ll be watching this blog for more news as it comes out, including details of what’s really happening versus the partial story Mt. Si is posting on its facebook page…. What are the facts? When does the community get to hear the whole story? We receive limited information that the Mt Si Food Bank is closing and one week later the Snoqualmie Valley Food Bank is opening. The Snoqualmie Valley Food Bank will be in the exact same location, will have the exact same paid staff and the exact same Operational Board. It seems the only things changing are that the Valley Ministerial Association is no longer involved and all the equipment, furniture and funds that were donated in good faith to the food bank are moving on and these items are being requested again from our community. If the Valley Ministerial Association is withholding equipment, furniture and funds from the service they were donated to, I ask that they do the right thing and pass them over to the Snoqualmie Valley Food Bank. Hundreds of thousands of dollars were given in good faith, and now it is time for your group to make sure those donations fund the food bank recipients of this valley as designated. I agree, Susan. I think the SVMA has some explaining to do. Boards don’t just up and resign without there being some underlying issue. Given the deafening silence from the SMVA, we can only guess at the reason. – The MSFB board resigned suddenly en masse. That’s an extreme action that suggests they had unanimous concerns about… what? – Certain organizations have reportedly asked that their charitable contributions to MSFB be returned. That’s an extreme action that suggests they had concerns about… what? – The North Bend Community Church reportedly (as reported here and elsewhere} asked the MSFB to move out of the facility that they have generously provided for many years. That’s an extreme action that suggest they had concerns about… what? – The MSFB has moved out, taking all the food, supplies, equipment, et al, without any clear plan as to what they will do with it, and where they might do it. Now, I don’t question their sincerity or intentions. However, given their charter, that’s a surprising tactic which doesn’t appear to be very broad-minded. these were donated by the community for the purpose of supporting needy families. But that’s not what they will be doing for the foreseeable future. SVMA and MSFB owe it to the community to be forthcoming. It’s unfortunate that they’ve chosen to ‘take their ball’ and leave, requiring the community to step up once again and provide food and equipment that has already been provided once. “We would like to start with a bit of history. Prior to 1975, persons in need of essential life necessities in the Snoqualmie Valley approached individual churches for assistance. While this approach helped many people is was far from ideal. Some people would approach multiple churches, receiving assistance multiple times for the same need. Others were unsure of where to go and went without, desperately needing assistance. Because of this, area pastors decided to facilitate the formation and operation of a food pantry. In 1988, a group of senior pastors formed a faith-based non-profit corporation, called the Snoqualmie Valley Ministerial Association (SVMA) under which their various ministries could operate. The Mt Si Food Bank is one of the ministries of the SVMA governed by its Board of Directors. The SVMA also has ministries that provide emergency help for transients and energy assistance for those in need. In 2008, after running and managing the food bank for over 30 years, the SVMA Board of Directors decided to install a management team to handle most of the daily operational tasks of the Mt. Si Food Bank under the direct oversight of the SVMA board. The SVMA board hired two part-time staff members and approved memberships in a volunteer advisory board. Recently, the SVMA-appointed management team indicated a desire to change the status of the Mt Si Food Bank from a faith-based not-for-profit organization to a secular not-for-profit organization, this was a major shift in the vision and purpose of the ministry. The predominant reason given was so dollars could be received from those who do not want or allow Christian beliefs to be expressed. This proposed change was fundamentally opposed to the charter of SVMA and the principles with which it founded and operated the Mt Si Food Bank. For the SVMA member pastors, and for thousands of volunteers and donors throughout the Snoqualmie Valley, feeding the hungry is not simply a charitable work: it is a means for exercising and expressing our faith. This has been true since the food bank was started back in the 1970s and it continues today as the Mt. Si Food Bank. The disagreement over whether the Mt. Si Food Bank should have a faith- based or a secular structure led to a split between the leadership of the Mt Si Food Bank and the management team. Some individuals from that management team have chosen to pursue an alternate path and are launching a new food bank. We wish them nothing but success. to gain control of those resources – much through the court of public opinion. The SVMA has chosen not go this route and will not participate in a battle of words and accusations. That is not God’s plan. Multiple attempts at reconciliation have been rebuffed or ignored. No matter what you may have heard, all food bank funds and goods in SVMA possession are being used legally and appropriately to further the ongoing mission of the Mt. Si Food Bank. The Mt Si Food Bank has been a cornerstone of the Snoqualmie Valley for the past 38+ years. We are committed to continue being a positive resource in the lives of those that draw upon those services. Because of unfortunate actions by others we are currently looking for a new home to operate the ministry. Please be praying for this to happen quickly, we are looking at space this week and could possible move in before the end of the month. We look forward to continuing our operation of providing a helping hand to those in need in the very soon. If the Mt Si Food Bank does not reopen, will the money it raised be donated to new food bank or will it go to the churches in the SVMA? It is my understanding that the SVMA DID NOT APPROACH the food bank, but the food bank approached them about using their non-profit status to open the food bank. Is this correct? You appear to be implying that the SVMA put together the management team of the food bank. I’m fairly certain the management team of the food bank was already put together when they approached the SVMA. Could you clarify this for us?